NOTE: If you intend to read this book do not read what follows because it may spoil your enjoyment. For quite a lot of this book I wondered what it was about. It isn’t usually a wonder I have about novels, because I read them primarily as entertainment. Perhaps it wasn’t the ‘about’ I was worried by, but my inability quite to recognize its genre (I know that’s a horrible film-studies type word, but I am trying to figure out what bothered me). It was only after finishing the book that I realised it was tragedy. Perhaps tragic-comedy. It is about the fall, through time, of a great man. It even finishes not far from a place called Shakespeare. It actually concludes in a place called Lordsburg. Roughly translated this could mean Heaven, couldn’t it? City of God at least. And Michael Beard, our anti-hero, is a sort of pre-Christian St Augustine. He is gluttonous, lecherous, slothful, greedy, proud and wrathful. He doesn’t appear to be all that envious (and yet his downfall hinges on ideas stolen from another and passed off as his own – and he is certainly capable of jealousy). In a sort of riff on the theme of Amadeus, this monstrous creature is given the opportunity and has the talent, the brain, to save the world from environmental disaster. As in Saturday McEwan weaves the private and the public together in a Feynman’s Plaid (you’ll have to read the book). Unlike Amis, the most indiscreet of authors, McEwan is invisible. The problem is, despite his great technical abilities, he very rarely moves his reader. And although this is a much better book than Martin Amis’s perhaps it is the Amis I’ll remember longer. Odd. The truth is that had this been French (think Julie Delpy perhaps or the late Eric Rohmer) critics wouldn't have had a problem with it. They probably wouldn't have bothered to go in the first place, but those few with a modicum of intellectual curiosity who did venture out would have found this a charming meditation on the vagaries of l'amour. But it is a British movie and therefore altogether much more ambitious (how many British movies can you name that are investigations of an abstract noun?). It is not a comedy, it is not a drama, it is not even a piece of social observation. It is, in other words, rather foreign to English sensibilities. We must pity the critics. They understand Hollywood, they understand British social comedy, they assume that films in a foreign language are beyond the public they so often condescend to, but they don't get My Last Five Girlfriends. Of course, it should have retained the title of the book it is adapted from, Alain de Botton's 'Essays in Love' ('essays' as in 'experiments'). That would have signalled the abstract, meditative nature of the piece. The marketing has served the film very poorly: this is an art house independent, a movie for grown-ups. Couples are not going to roll out of the cinemas wiping the tears from their eyes or pledging undying love to one another, or reminding each other of "that great bit where". This is a low budget film which has attempted high budget effects, but the result is curiously refreshing. Artifice is to the fore - it underlines the refusal to deal in the usual cliches. All sorts of different film techniques are used and these serve to suggest all the very different ways in which the narrative of a love affair can be told or understood. The central character is not particularly charming or attractive; perhaps he is occasionally wry, but we are not invited to empathise. This is an anti-sentimental film from which you depart thinking rather than swooning. Lo Fi Culture Scene at The Borderline last year. 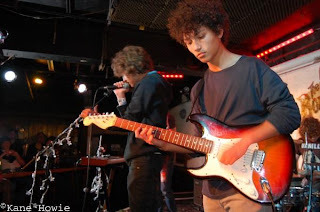 There is a rare outing in their GCSE year for Lo Fi Culture Scene at the Two Thousand Trees Festival. Details here. They'll be trying out three or four new songs. Beautiful venue. 16 / 17 July. Height of summer. Early entry tickets available for a short time here. Take note anyone happening upon this here blog who might be in the vicinity of Southampton during the month of April. paintings by Marilyn Walters, doubtless very good, photographs by Wynn Rees, doubtless excellent. Hide and Seek, an exhibition of Sirpa's most recent work opens at Highgate Contemporary next week. Go and see it. Details here. Gavin Henson is reportedly back in training. The Lord be praised. Just in time for the World Cup. I think Ms Church deserves credit for this. Had this book of short stories been written by a French woman it would probably have been called something like ‘The Limits of Intimacy’. However, irony, rather than abstraction, being the English mode, the title refers to a not altogether care-free childhood as described by the narrator (sometimes narrators) in most of these stories. They bring news from the borderlines of intimacy between siblings, between parents and children, between husband and wife. It is a place where words are spoken and misunderstood or left unspoken, where words seem more often inadequate or inexpressible than a help to communication. Silences and bent silences occur: a daughter sees her mother naked for the first time and “a gulf seemed to have closed”, but opens again once the clothes are on, “the TV covering up our silences”. A delinquent foster child with a fetish for cars is discovered in the 16 year old narrator’s bedroom, his face perfectly made up. He kisses her – “it was like vanilla” – and puts his hand beneath her bra. He stops suddenly and she is left breathless: “I didn’t say anything, not words, but I wasn’t silent any more”. Almost all the stories are set in Eastbourne, and there is a distinct sense of the sea, of the big blue, that seems to emphasize the loneliness, or at least the solitude, of many of the protagonists. More than once at the end of a story I was put in mind of the final lines of Larkin’s High Windows: And immediately / Rather than words comes the thought of high windows: / The sun-comprehending glass, / And beyond it, the deep blue air, that shows / Nothing, and is nowhere, and is endless. Godless, we retreat into the privacy of ourselves. The melancholy is real, and sometimes becomes tragic; what is remarkable is the manner in which the ordinary is invested with significance, and the reminder that behind closed doors, in the interstices of private arrangements, life flares and is doused and perhaps flares again, and that there are stories everywhere. Thoroughly recommended. Very good book. A work of criminology, sociology, literary history, and more besides. First rate journalism, but with a distinct literary bent (it ends with a stab of the first person that is as sharp as the crime itself). And though there is a suggestion - the crime remaining mysterious - that this will not be the last book on the case, i cannot imagine a better, and certainly not a more enjoyable one. if you want a portrait of mid nineteenth century England, this is the place to start. "Mother and I grimly chew Rye-Vita, with a hard tearing sound, two dromedaries eating the Sheikh's tentcloth". Wonderfully vivid and funny sentence in a letter written from Brian Murphy to Huw Wheldon, sometime during the war. “I don’t speak English very well, but I speak Welsh like a motorbike”. NB I happened upon a newspaper reporting this, today, 1 March. Serendipity.